Product prices and availability are accurate as of 2019-04-17 05:19:21 UTC and are subject to change. Any price and availability information displayed on http://www.amazon.com/ at the time of purchase will apply to the purchase of this product. The Whynter ARC-122DHP portable air conditioner provides 12,000 BTU cooling and 10,000 BTU heating output in a compact and portable profile. The dehumidifier mode extracts 76 pints of excess moisture in a 24-hour period. This model is equipped with a Self-Evaporative system which exhausts most or all condensate under average ambient conditions. It comes with an internal condensate Auto Pump that can be activated to pump out excess condensate that may accumulate in high humidity conditions. This portable air conditioner uses non ozone-depleting R410A refrigerant and is made with all RoHS compliant components that are free of toxic chemicals. The unit can be easily setup in almost any indoor location and is most commonly used in data closets / server rooms, bedrooms, classrooms and garages / workshops. When the water tank is full, the compressor will shut down and will not start back up before the tank is emptied. Alternatively, the Auto Pump function can be utilized to pump out (and up to 10' of vertical lift) moisture through the included 16.5' drain tube for continuous condensate removal. Equipped with an intake and exhaust hose, this system allows for more air intake, cooling power, and constant air pressure, which results to a faster cooling rate than comparable single-hose units (can be operated as single hose as well). Equipped with a remote control that can easily control the speed, temperature, and dehumidifier settings, the ARC-122DHP also comes with rolling casters that will allow you to move the portable air conditioner room to room. Save energy and money by setting the unit to run only when you need it. The timer allows you to set the unit to cycle on or off automatically. Its programmable features, operating modes, and versatile design makes this unit a great option for keeping rooms up to 400sf cool and comfortable (ambient temperature and humidity may influence optimum performance). * AWARD WINNING : 1. Good Housekeeping's "Best Portable Air Conditioners to Buy in 2019" 2. The New York Times Wirecutter named "the most efficient and fastest cooling portable AC" * Four operational modes: air conditioner, fan, heat or dehumidifier. 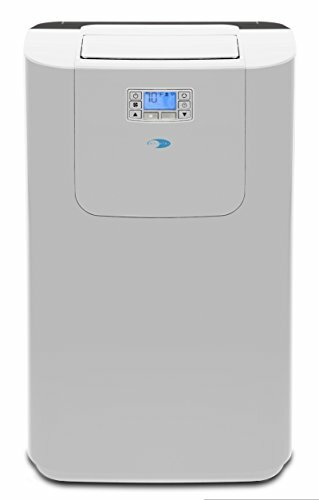 This unit can cool up to a 400 square feet space (ambient temperature and humidity may influence optimum performance) * Full thermostatic control (61°F - 89°F) with digital readout, 24 hour programmable timer; Eco-friendly CFC free Green R-410A refrigerant; Patented auto drain function fully exhausts all condensate automatically in most environments * Remote control, activated carbon air filter, washable pre-filter, and product manual packaged inside exhaust hose; Noise level (dBA): <52; AutoPump function that pumps out excess condensate. * Full installation set includes extendable exhaust and intake hose (up to 60") and window kit (up to 46") Max. window kit length = 46" , Min. window kit length = 20".